By performing the Shravan Somvar Puja on any Monday of Shravan month, a person gets good health, wealth and happiness. He is protected from all kinds of Evil effects and Enemies. Lord Shiva is one of the deity in the Hindu trilogy, along with Lord Brahma and Vishnu. He is the destroyer of all evil, and the one who bestows the greatest blessings when pleased. The entire month of Shravan ( Saawan ) is dedicated to Lord Shiva & especially the Mondays that fall during this month are considered most auspicious days for offering prayers to Lord Shiva and getting his blessings for the entire coming year. The Shrawan Maas ( Month ) is the 5th month in the Hindu Calendar. During this month, the Nakshatra Shravan is the ruling Star on full Moon day and therefore this month has been named as Shravan. This entire month is dedicated to Lord Shiva and worshipping him during this month is said to bring most Auspicious results and blessings of Lord Shiva. By performing this Puja, a person gets good health, wealth and happiness. He is protected from all kinds of Evil effects and Enemies. Please mention the Date / Dates of your Choice to get the Shravan Somvar Puja / Pujas to be performed in "Other Information" field provided above along with the main image. Swasti Vachan, Shanti Path, Sankalp, Ganesh Sthapan, Lakshmi Sthapan, Kalash Sthapan, Lord Shiva Sthapan, Navgrah Sthapan, Brahma Sthapan, Agni Sthapan, Invocation of all Gods & Goddesses, Navgrah Mantra Japa (1 mala for each planet), One Path of Rudra with Chamkam, Lord Shiva's Abhishek with 108 Bilva Patras (offered as Archan), Recitation of Rudra Ashtakam for 108 times, Recitation of Lord Shiva Mantra (Om Namah Shivay) for 1100 times, Homam with Honey, Ghee, Sugar, Til, Oats ( Jow ), Ashtagandh, Sandalwood powder, Navgrah Samidha and then Lord Shiva's Aarti, Prasad to Brahmins. 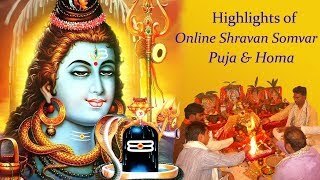 We will inform you about the exact Timings of Online Shravan Somvar Puja & Homam via Email.